In the early stages of development a new drug must be tested in a series of human clinical trials. The earliest phases of trials aim to assess the safety and tolerance of a drug in human volunteers. In planning such trials you face an obvious question: what initial dosage to use? Of course, you want to do your best to avoid giving human volunteers drugs at dosages that may be harmful to them. So you ask yourself — Is there any way to get some information about safety limits before proceeding with exploratory human studies? Specifically, could data in pre-clinical studies where we expose cell cultures or animals to the drug be used to predict the maximum human tolerance dosage for the drug? In one classic study, Freireich et al (1966) performed a quantitative comparison between the toxicity of anti-cancer agents in mouse (and other species such as rats, dogs, and monkey) and the human maximum tolerated dose. All species provided good predictability of human response, but let us look in detail as some data from the mouse. These investigators measured the dosage (in milligrams per surface area) at which 10% of the mouse population died (so-called lethal-dose 10%, or LD10) and compared that to the maximum tolerance showed by human volunteers. The comparison was done across 18 different anti-cancer drugs. 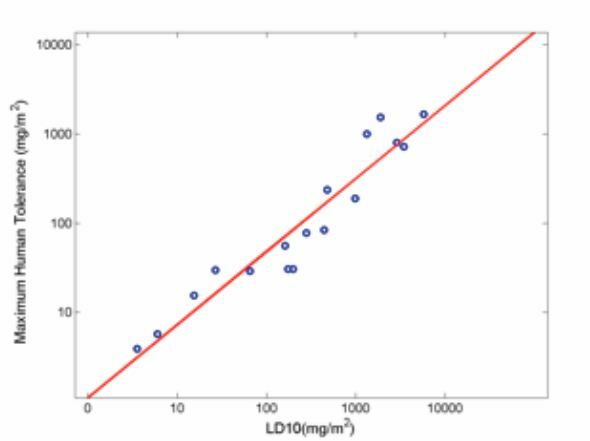 The data are re-plotted below with the x-axis representing the LD10 value in mice and the y-axis the maximum tolerated dosage in humans. The actual data points are the open blue circles and the red line represents the best linear fit. The correlation coefficient — a measure of association between the mouse and human data — is 0.95. A perfect agreement between mouse and human response would have resulted in value of 1.0. If there was no relationship whatsoever between the two datasets, as claimed by some opponents of animal research, the correlation coefficient would have been near zero. As it turns out, 90% of the variability in the human data is accounted for the mouse data. The likelihood of such figure resulting by chance is less than 1 in a billion. In other words, the association between the mouse and human data is highly significant. To illustrate the meaning of these numbers consider the following scenario. Assume you are in the possession of this graph and you are asked to volunteer to participate in a clinical trial for a new potential anti-cancer drug which has an LD10 value in mice of 10 mg/m2. Would you be willing accept an initial drug dose of 100 mg/m2? What if the LD10 value of the proposed drug was instead 10000 mg/mm? Would you now be more or less willing to accept participation in a trial with initial drug dose of 100 mg/mm2? Was the graph useful to you in making a decision about your participation on this clinical trial? Would you rather make your decision based on such data or by flipping a coin? Do you honestly believe the two methods equivalent? Don’t you think it would be important for scientists to obtain such information before proceeding to inject arbitrary doses of a drug in human volunteers? True, toxicology assessments are not perfect and they can be improved. In fact the methods for the evaluation of novel cancer therapeutics have indeed been improved over the past decades. There is also no doubt that, in this process, we are morally obliged to seek alternatives to the use of animals in drug screening and testing, and work in this area is actively pursued. If such methods can be developed and validated they should be adopted. It should be noted, however, the use of animals in toxicology is arguably one of the least common uses of animals in science. Attempts to equate toxicology testing to the whole enterprise of animal research make no sense at all. Anyone confronted with the above evidence that continues to argue that in going into a clinical trial “you might as well flip a coin” is simply not credible: pre-clinical trials in cell cultures and animals have predictive power. Anyone claiming to be in a possession of a theory that proves animals cannot be predictive of human response is wrong — as this position is refuted by the data. Anyone denying the uncountable contributions of animal research to human health is intellectually dishonest or ignorant of medical history. Animal rights activists are free to object about the use of animals in research based on ethical grounds, but they cannot do so by robbing science of its accomplishments or denying the important role they play in medical science. Posted on July 27, 2011 December 19, 2013 by EditorPosted in News, Science NewsTagged animal research, animal rights, animal testing, clinical trial, correlation, predictability, toxicology.